If we exclude from consideration all bottles made after the 1960s, when this bottle was first published (helping to create a demand for them among collectors), early bottles in the material are relatively uncommon. Modern production began in the mid-1960s and continued sporadically for a few years before petering out, so even that was hardly a flood of wares onto the market. Other early examples are in Stevens 1976, no. 682, with a rare matching stopper, and, among his favourites, no. 1020; Sotheby’s, Billingshurst, 31 March 1994, lot 121; Sin, Hui, and Kwong 1996, no. 273; Chinese Snuff Bottles No. 4,p. 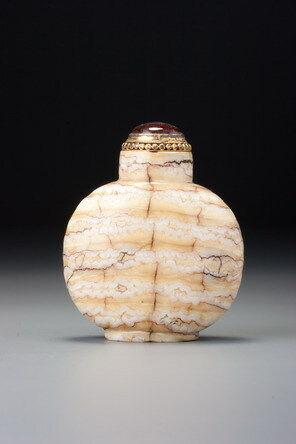 17, also with a rare, original stopper; and one from the Exstein Collection, Christie’s, New York, 21 March 2002, lot 91. This is one of the largest and most impressive of the early examples and was one of the first published, so it has become rather famous. 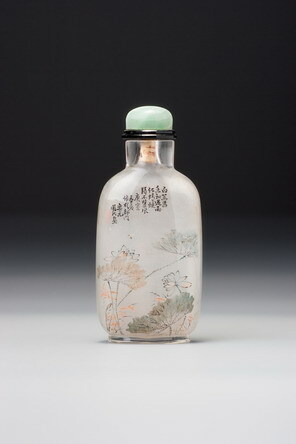 Its celebrity, of course, was helped by association with the name of Alex Cussons, a pioneering English collector of the mid-twentieth century, whose collection featured in the first issue of Moss’s Chinese Snuff Bottles magazine and whose generosity funded the magazine. Like ivory, the material takes on a lovely patina over a long period of use.